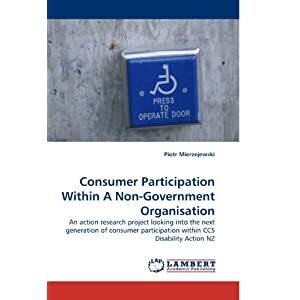 With backing from CCS Disability Action NZ and Otago University, a preliminary research project is conducted into the best possible ways of including consumers served by CCS at the local level into its mission. People with disabilities, CCS staff and other stakeholders attended this workshop. Disability rights activism and social inclusion movements have played a significant role in establishing strategies for the inclusion of people with disabilities into the wider community. The results CCS gathered from the workshop showed that their service consumers were strongly committed to the value of the organisation and wished to be fully involved, both as participants in the guidance of the CCS Disability Action organisation in its service delivery and in developing its role of advocating for people with disabilities. The concept of allowing the service user population to participate in developing organisational strategies is theorised, from a constructionist perspective, as being critical to increasing the accountability of the organisation towards its users and is conceptualised as a sharing of power that will lead to both change and growth.